comfortable as possible and immobilized as effective as possible to prevent motion artifact on the images. This is often accomplished by placing small wedge sponges on either side of the patient’s head. Suspension of breathing for head CT studies is not necessary in most cases. Anatomy of the head displayed in cross-sectional slices will look slightly different depending on the angulation of the gantry used. This slice angulation is determined by the position of the patient’s head by moving the chine up or down and the angle of the gantry. Orbitomeatal line is was once common to be program the cross-sectional slices of the brain to be parallel with it. But however, more recent practice favors using the supraorbital meatal line also known as the glabellomeatal line to reduce radiation exposure to the lens of the eye. A disadvantage of many multi detector CT system is that they do not allow the gantry to be tilted when in helical mode. 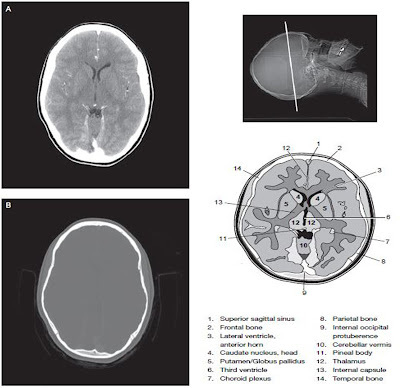 Therefore, axial or step-shoot techniques are often used for routine brain imaging. 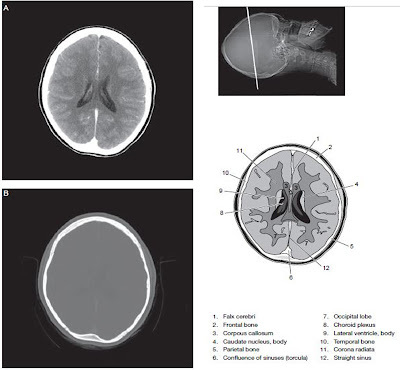 Brain CT protocols are often designed to meets the needs of a specific structure or organ like circle of Willis or to adapt to a particular clinical indication, like suspected spinal arteriovenous malformation. Many factors must be considered in the devilment of a scanning protocol. Changing the image plane from axial to coronal may provide additional information. 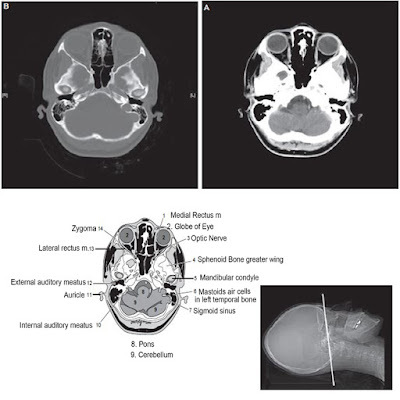 These are the two methods of achieving a coronal position for head scanning. Placing the patient in prone position on the scanning table and ask the patient to extend the chine forward. Placing the patient supine and ask him to drop his head back as far as possible. This position is usually requires a specialized head holder in either position, the slice plane will be coronal. If the patient cannot extend the neck fully, the gantry may be angled to obtain a more coronal plane. The images obtained in either the prone or the supine coronal position is essentially the same. Obviously the image are flipped inferior-superior. The preferred position involves several factors, including patient comfort, radiologist preference, and the effect of gravity on anatomic structures like fluid settle inferiorly of superiorly? 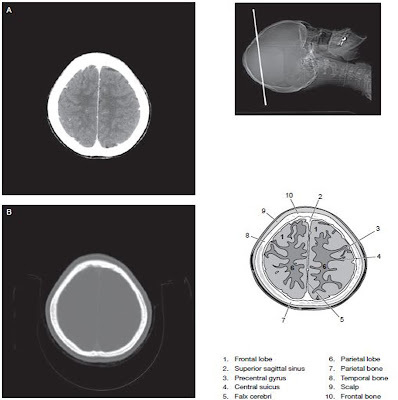 Imaging of the posterior fossa of the brain is a challenge in CT scanning. 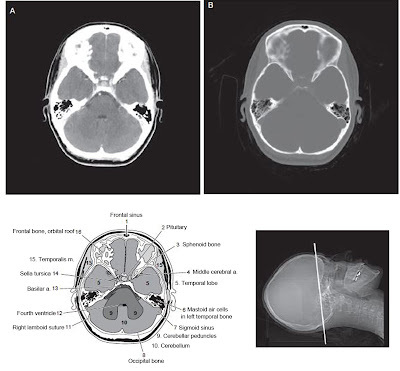 Because of the great difference in beam attenuation ability between the dense bone of the skull and much less dense tissue of the brain, streak artifacts are common. This inherent limitation may be managed by decreasing slice thickness when scanning the posterior fossa and increasing the kVp setting. 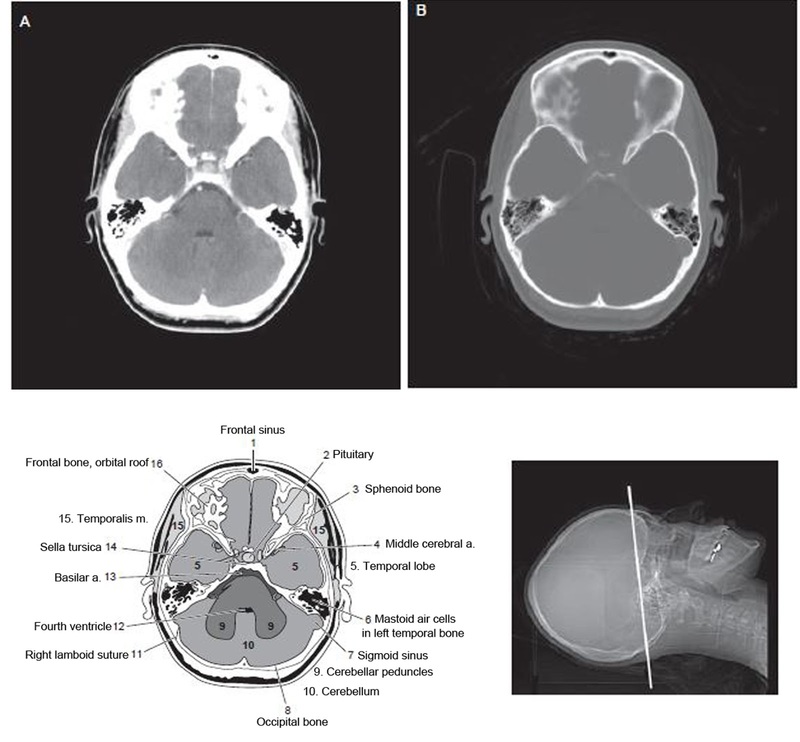 Because of the dense bone of the skull, beam hardening artifact is common in the posterior fossa. 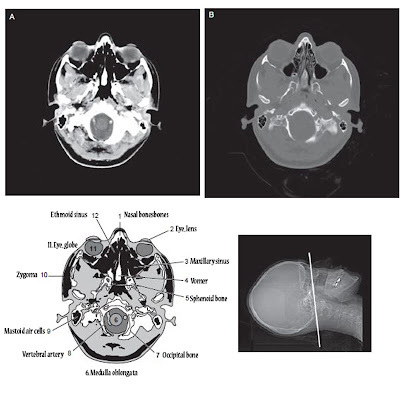 Modern multislice CT scanners allow studies of the head to be routinely acquired with thinner slices than in the past a 1.5 mm thickness is typical. These thin slices help to reduce beam hardening artifacts. Images are often merged in thicker slices for viewing. In examination of the head the helical CT mode is used mainly for the purpose of generating three dimensional reformations or to minimize motion related artifacts. 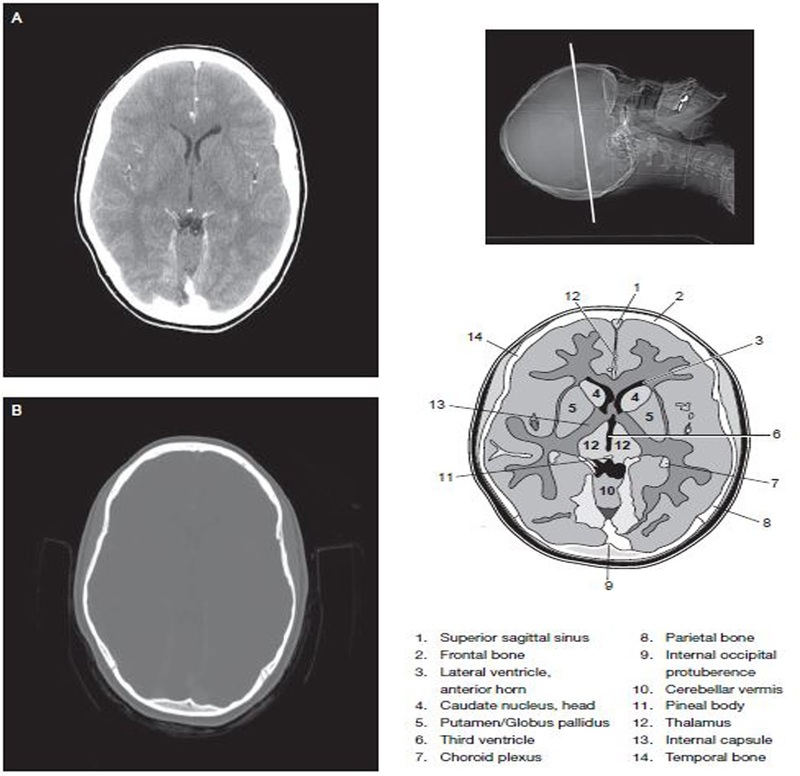 In general, routine head studies are done using an axial mode, and CT angiography CTA studies of the head and neck are done using a helical mode. 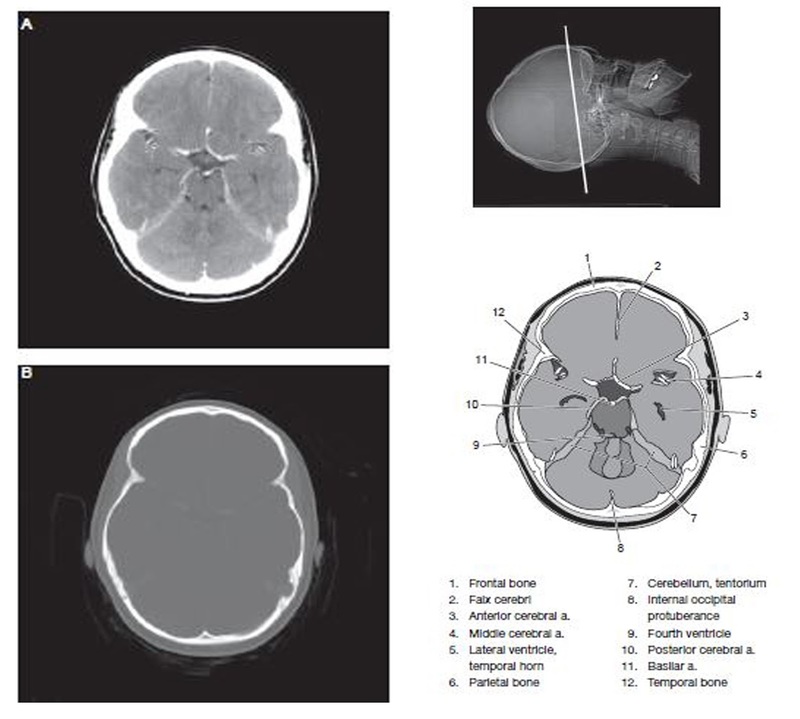 Cross sectional slices of the brain are viewed in multiple window settings. Starndard window setting include soft tissue like brain 160 / 40 (approximate window width / window level) for slices in the posterior fossa, 100 / 30 for slices above; bone particularly on trauma or postoperative cranio patients 2500 / 400 and blood is 200 / 60. Routine scans of the brain is usually starts at the base of the skull and continue superiorly. Depending on the clinical indication, the scans may be done without IV contrast enhancement, with IV contrast enhancement, or without and with IV contrast enhancement.